If we go by the basic dictionary definition, then career counseling refers to the assistance or guidance provided by a professional on career opportunities best suited for the individual. “Best suited for the individuals” here means that career counselors must assess the strengths, abilities, aptitude, personality, and interests of the individual to carefully gauge, analyze and understand them, and thereby, after proper consultation with the person and based on a scientific analysis of ‘who, why, what, where, when & how’ they are, the counselor then advises the individual on the right career path. This means that the individual is exposed to the knowledge of not just his own self, but also the careers which will best match his strengths, which eventually lead to higher job satisfaction. Because your best friend took up that particular subject / course / job. Because your parents / elder brother/sister, relative told you that a particular subject / course / job is very promising and your future will be set if you take it up. Because you got very good marks and you were meeting the eligibility criteria for a top notch subject / course and so you took it up. Because you got very low marks and you were not meeting the eligibility criteria of any subject / course so you took up whichever option was available to you. Because you were clueless about your interest and did not have any plans about your future career, so you went with the flow and took up that subject / course / job which was easily available at that point of time. Because you had an interest in something so you presumed that you will be able to do well in a subject / course / job related to your interest. Because you did not want to follow the conventional career choice of what everyone else was doing and wanted to do something different than the others and therefore, you took up a subject / course / college which you felt was the most off-beat. Because you are lured by the glamour / fame / money which is associated with a particular lifestyle. What most of us do not realize is that success in life and in careers will not come if our decisions on subject / course / job choices are based on what our friends are doing, or what our parents and family or we feel will suit us, or purely going by what interests us. It is a well researched fact that almost 65% of college students want to change their fields in college because they have chosen the wrong subjects. It is also a researched fact that over 80% people feel stressed at work because of being career misfits. This subject / course / job dissatisfaction happens because we do not realize what our strengths are, what our personality is like, and what kind of aptitude do we have. We follow the norms that have been set for us and do not look within our own selves to find our own hidden talents. The story of the movie "Kung Fu Panda" can be good example for understanding this concept. A baby panda bear called Po was raised by a goose bird called Mr. Ping, however, that does not mean that he himself will be able to become a successful goose. The panda cannot fly like the goose, nor does he feel happy doing the soup business like his dad. This is because the panda has his own aptitude, interests, personality, and skill set. He became happy with his new found career of a kung fu warrior because it matched not just his interest, but also his aptitude, and interest. His personality initially did not math up to his career of a kung fu warrior, but after receiving some guidance and tips from his master, he was able to enhance his personality and do well in his career. The trait of aptitude is not visible on the surface. It is internal and needs to be explored by each one of us. While personality is external, but it can always be enhanced with proper guidance. 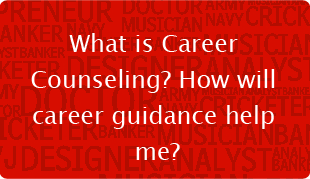 This is where the role of a career counselor comes into the picture. The expert team of psychologists at MapMyTalent analyzes the inherent potential of each individual through scientifically developed psychometric tests and instruments. This analysis is then related with the education background, economic factors of the individual, location factor, family scenario, among a whole lot of other things. It is only after this thorough examination of all factors that the counselors guide and advise the person on the best suited career path. How this information will help you is that based on this report, not only you will get clarity on your own strengths and the best suited career for you, but it will also chalk out a RIGHT career path, advising you on what you should do to build the career that fits you the most. Need help in discovering your inherent talent? Let MapMyTalent help you. Register with MapMyTalent and take the Test to find out your strengths. Also explore a self help method for making career decisions.